Played around with a set up for the outside cats, in the sun room. This is what I’ve come up with. I had another crocheted blanket that we used as a car blanket hanging around. I decided to try draping it from the back of the swing bench to the back of the transfer bench. It’s incredibly heavy, so I knew it would need support. I have some sheets of foam insulation among my craft supplies that I thought would work. Unfortunately, a sheet is just barely long enough to reach the backs of both benches – which means a stiff sneeze would have knocked it down, never mind rambunctious cats that are sure to jump on top of it. After going through what was available in the room, I ended up putting one of the unused, home made plant stands on the transfer bench. That would support one end of the sheet of foam insulation. 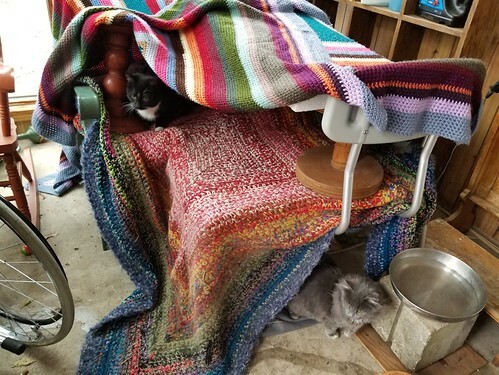 After draping the blanket over, I folded up one corner for access, and it immediately drooped into where the cats like to sit. So I found another plant stand to hold that up. As you can see by the photo, Doom Guy and The Outsider were quite ready to check out the new digs! In fact, Doom Guy surprised me by already being in there when I first picked up the corner to open it up. I never even saw him jump under while I was laying it out! I don’t think there is going to be much hesitation for the cats to use it. Especially today. Though the temperatures have warmed up, there is a nasty, bitter wind out there. I think everyone, human and animal alike, will be staying indoors as much as possible today!